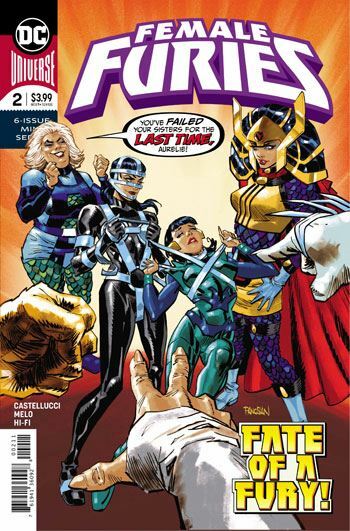 I was blown away by the first issue of Female Furies, but expected that my enthusiasm would dampen a bit with the second issue. That was not even close to the situation. Castellucci and Melo manage to top their achievement, delivering an issue that is even darker and more disturbing than the first, yet still sprinkled with the same twisted humour. This issue develops Auralie, a character who was important in the origin of Mister Miracle, but never really developed on her own. In Kirby’s Mister Miracle, she was an oppressed young woman who the young Scott Free met, a Fury in training, who only dreamed of dancing. In this issue, Auralie comes off as a strong warrior, subjugated and abused by one of Darkseid’s elite. Her attempt to seek some form of justice leads to her being scorned, disbelieved, and mocked, and she winds up worse off than ever before. Her friendship with Big Barda, also an element of the Mister Miracle backstory, is shown here as well. Castellucci has certainly done her homework, and it doesn’t take too much effort to see how Auralie’s story arc will bring her to the place where Kirby portrayed her. The issue even comes with a very cool twist ending, utilizing Beautiful Dreamer, of the Forever People. Although of course it would help to have a familiarity with the Fourth World stories to fully appreciate this miniseries, I believe the strength of the characterization, and the enjoyable execution of the art and story, would make this an entertaining book for those who had never experienced the Female Furies before.